I wanted to post some pictures of my garden. Being my first garden and that it's organic, I was hoping to get some feedback and constructive criticisms that may help me next year. how does my layout look? 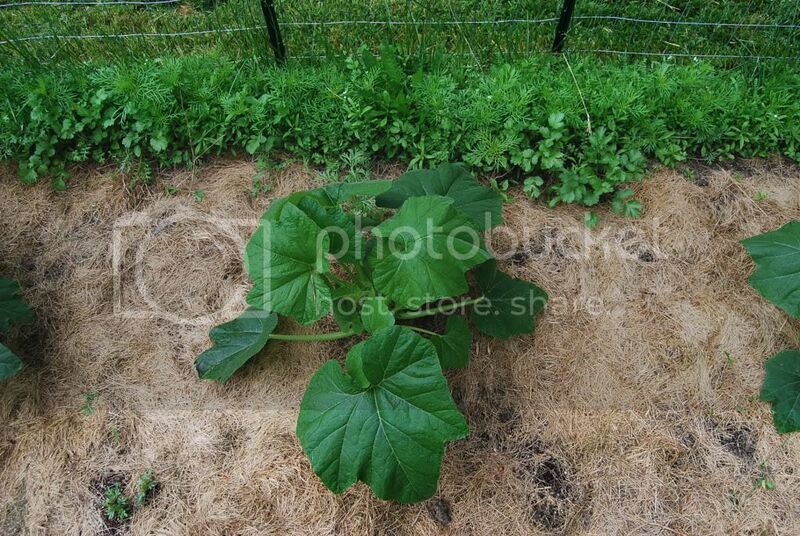 Here's a picture of my squash plants. 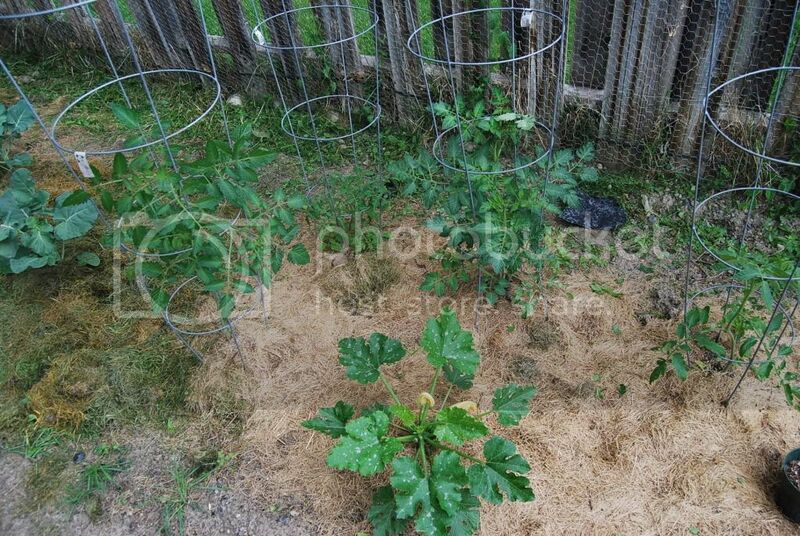 Are those the baby zucchini and yellow squash growing? 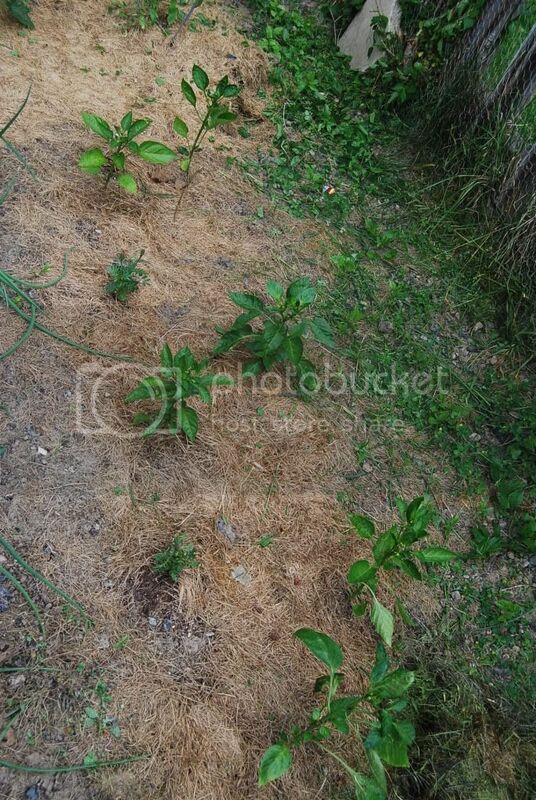 Here are my bell pepper plants. They are all 12" or shorter. Should I be picking the blossoms off to allow the plants to grow bigger before growing the pepppers? Here are my peas. They don't seem to be growing real well. 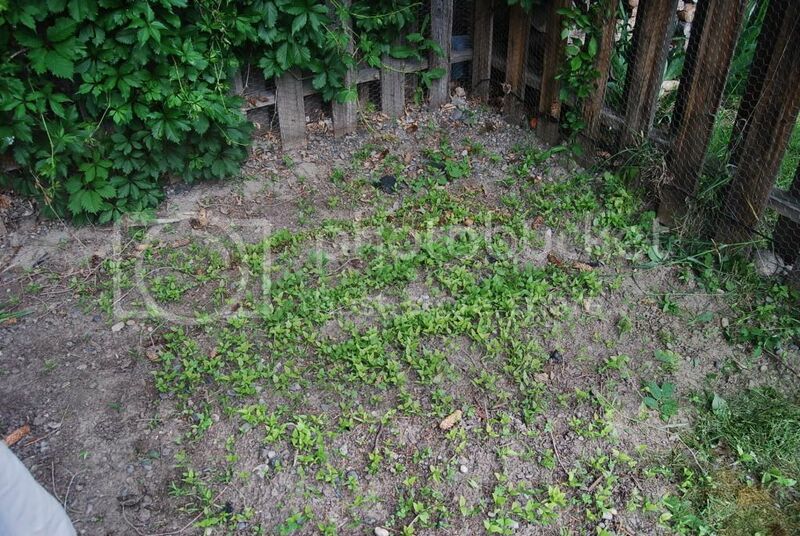 Here is my weed infested spinach and lettuce patch. I am working on a plan to replant and eliminate the week problem. Any suggestions?? That's a very nice garden! Be prepared, the yellow squash and zukes will probably grow to gigantic proportions making it tough to get to the plants behind them. Yes, you have a zuke and yellow squash in the making in the picture. As far as the weed infestation, get on your knees and start pulling them! Alternatively you can carefully hoe some of them down then pull the rest. Keep up the good work! Post another pic in a few weeks so we can see the progression! 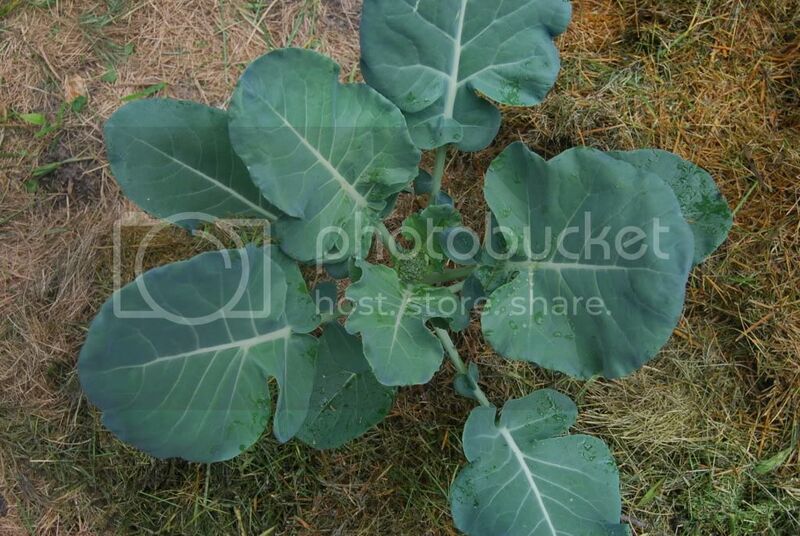 Use grass clippings, leaves, whatever you have on hand to put around the base of your plants. This keeps the weeds down because the sunlight is blocked. Put it thickly, and spread it over the empty spaces in the garden also. Your soil is looking pretty dry and hard. 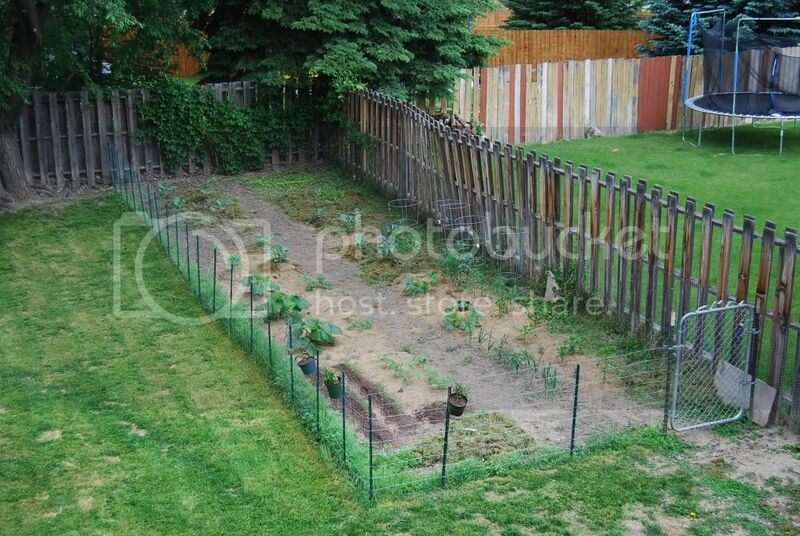 Typical of a plot that hasn't been gardening before. START A COMPOST PILE! 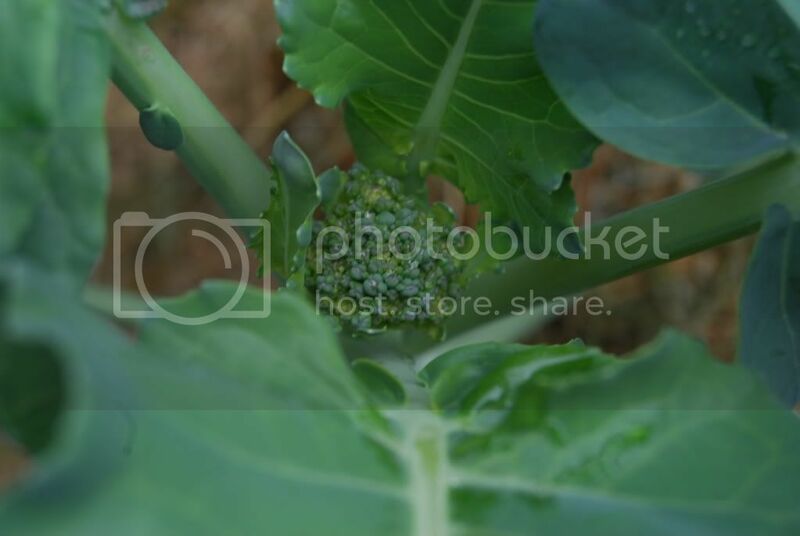 Look in the compost forum, there's tons of info about how to do it. Adding compost to the soil (repeatedly over a period of years) is the best thing you can do, so that eventually your garden plot will be full of lovely dark, loose rich soil. In the meantime, mulch everything! 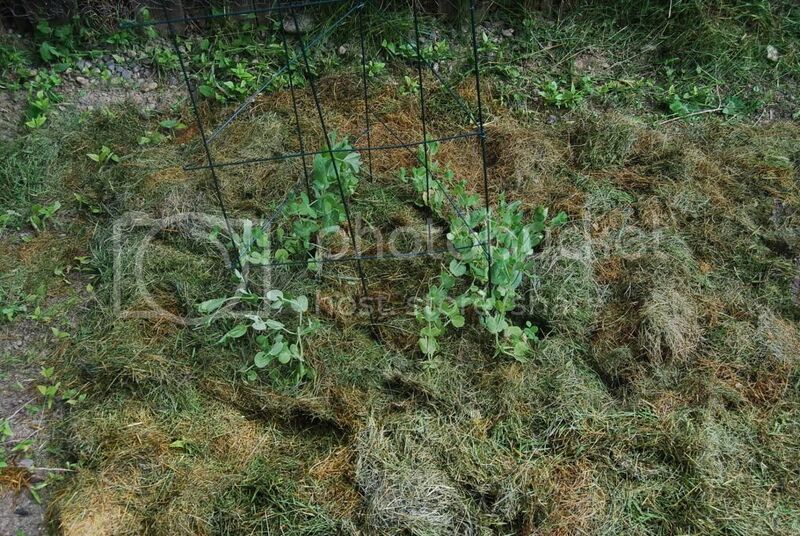 Can be grass clippings, wood chips, fall leaves, shredded paper, pulled weeds, whatever organic stuff you have around. 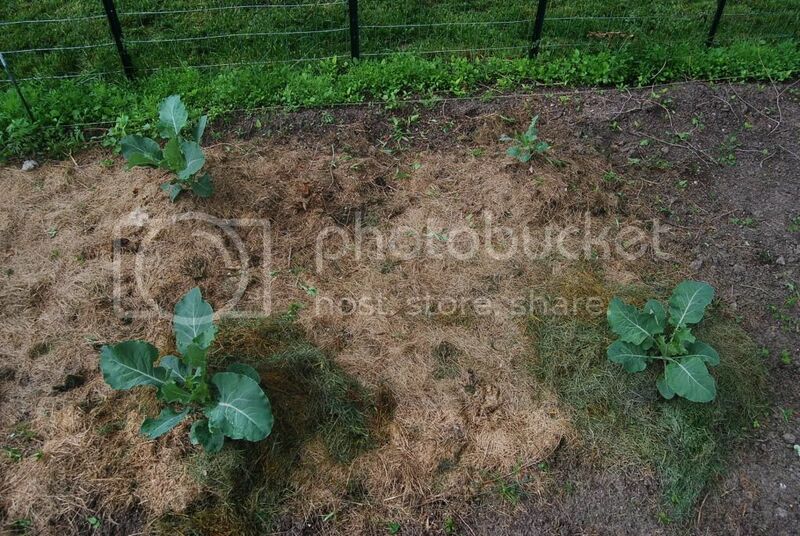 The mulch helps suppress weeds, hold moisture in the soil, and eventually breaks down and feeds the soil. I see you have mulched some things, but keep adding. Consider mulching the path too if you can... it all adds to the soil! I wouldn't bother replanting lettuce right now. It is a cool weather crop that does not like heat and I imagine Montana gets pretty warm in summer. You can replant lettuce (seed) in August for a fall crop. As was said, your squash/ zucchini plants (yes you have baby squashes on them!) if they do well, will get huge. You can train them down the path in the middle, but then you will have to step very carefully. Watch out for them over running your pepper plants, which seem to be struggling a bit. your garden is looking good, I would suggest, as the others have, to continue mulching. We also have very heavy, clay soil and mulching through the years, and adding compost has helped a lot. I'm in Northwest Montana and we had a bout of late blight last year, not sure if Southern Montana did or not, but be on the watch for that on your tomatoes and peppers. I just finally got my tomatoes in the ground yesterday and peppers will go in today. It's been a tough year with all the rain. Good luck and keep us updated. thanks everyone, for your great suggestions. I am mulching with lawn clippings as much as I can. I have finally gotten mulch around all my plants and will start spreading it out in the bare spots and walkway. I hope to start a compost pile someday; just need time to get around to it. Can anyone tell me about my bell peppers? This morning, I went out and gave them some fertilizer and picked all the tiny blossoms off of them (there were A LOT of blossoms) in hopes to help the plants grow a bit taller and stronger before growing the peppers. Was this a good or bad move? Thanks and yes, I will keep everyone posted with more pictures! From my experience pepper are always late plants, especially bells. Also they typically don't grow big compared to tomatoes and zucchini and things of that nature. Just be careful you don't grow the plant too big otherwise you might not get any peppers. Last year i thought that my plants were looking a little scrawny so i did the same thing and before you know it i had huge pepper plants but i only got 2 or 3 peppers total. Experiment with them, see how the climate in your area affects your peppers and try and perfect a system that works for your soil and your weather for next year. Oh and I'm a big supporter of straw mulch. I pack it on my crops real thick and get no weeds at all. One or two bales would probably do the trick for your garden, just make sure theres no seeds in it. thanks for the advice on the peppers! I guess I'm still a little unclear about what's considered "too small" or "too big" or "just right" for bell pepper plants. mine are probably between 10-12 inches tall right now. I did leave ONE nice blossom on one of the plants just to see if/how it would grow; however today it was about 95 degrees outside and tomorrow is more of the same, so now I'm worried it will succumb to blossom drop. Also..... It seemed before I picked the blossoms off that there were A LOT on each plant. Around 7-10. Should I let each one grow or pick some off to give the rest more nutrients and stuff? Well I'm no pepper expert, in fact I'm not even growin bells this year, But sure if you can get 3 or 4 from each plant that'd be great. It's hard to say how much a foot tall plant should or could produce but always better safe that sorry. Rather get 3 or 4 good peppers that 7 or 10 tiny ones that don't develop well. Bell peppers need a good supply of magnesium. Most soils are naturally low and can be amended by working in a tablespoon of Epsom salts at the base of the plants just when they are starting to bloom. This gives the plants magnesium sulfate which helps the plants roots absorb minerals. Just wanted to say, very nice garden and Epsom salt is not organic. Keep adding mulch. Epsom salt is a salt (not table salt, but a salt, in chemistry defined as ionic compounds that result from the neutralization reaction of an acid and a base) as are synthetic fertilizers. Salts tend to build up in the soil and ultimately kill off some of the soil bacteria and other life of the soil. When you really understand it, the difference between organic gardeners and non-organic, is about whether you worry about the biology of the soil or the chemistry of it. Non-organic gardeners just worry about the elements they are adding- N, P, K and maybe some magnesium or whatever. Organic gardeners are trying to create the biology that makes all those elements useful to the plants. Read Teaming with Microbes, which we had a book club discussion of here last year. What a lovely garden you have there. May I ask how long did the process or growing and setting it up take? I like the layout too, very detailed! KZHEN, thanks so much! This is my first garden and I am trying hard and still learning as I go. Well, we tore up the section last fall then this spring I rototilled (sp?) it a couple of times and added several bags of compost and extra topsoil to it. We have heavy clay soil here and I was trying to break it up a bit. Unfortunatly, it still needs a lot more admending but seems to be adequate. I started my tomatoes, zucchini, yellow squash indoors about the first of April. I tried to start more than that, but had to learn a couple hard lessons in seed starting. I bought the peppers, cauliflower and brocolli at a garden center. 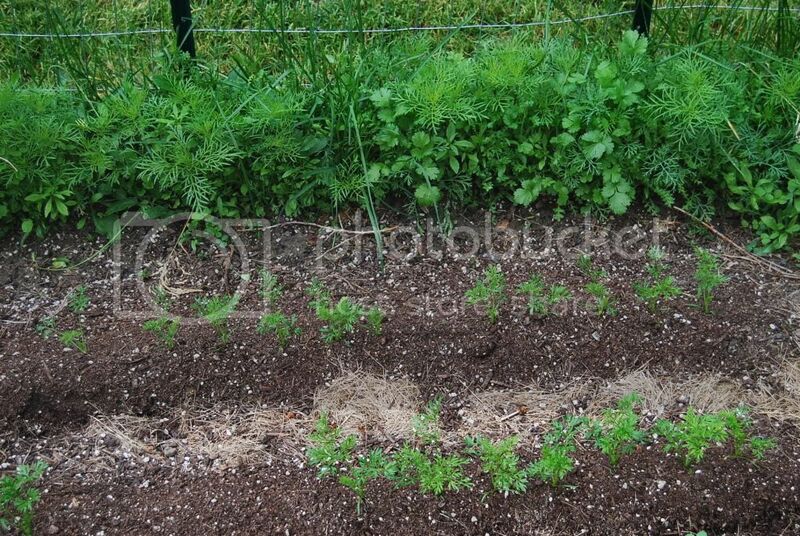 I think it was the end of may that I planted the radishes, carrots, onions, lettuce and spinach and asparagus. I should have planted my lettuce and spinach earlier. The initial tilling and planting of all the seeds and seedlings probably took me close to 15 hours. Now I go out about once a day and do some mulching, and pull some weeds. I'm trying to do it as natural as I can, so I put a bird bath in to encourage birds to come eat bugs, I planted marigolds to deter certain bugs, and I planted a "beneficial bug flower/herb boarder" to encourage pollinators and ladybugs and lacewings, etc to come to my garden. I'm using grass clippings as mulch and weed control. I don't get too crazy about pulling the weeds, I just try to keep them under control so they don't overtake the garden. I'm new to Organic Gardening and had some questions.